NVIDIA and ATI Cards Working Together Side-by-Side, This Is Revolutionary! 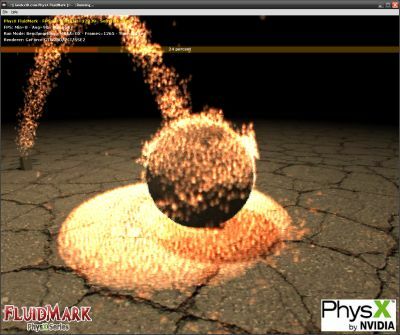 They used the oZone3D.Net PhysX FluidMark to compare CPU PhysX (score=759) and Hardware PhysX (score=2909). This is the proof that Radeon and GeForce can work together for a better gaming experience! The functionality of CUDA and its implementation of GPU-accelerated PhysX processing has benefited many a GeForce user. Users of ATI accelerators lacking this incentive either use Ageia PhysX card or avoid it altogether. It has been verified by Hardspell that in an environment where Radeon accelerator(s) do graphics processing, a GeForce accelerator can be used standalone to process PhysX. 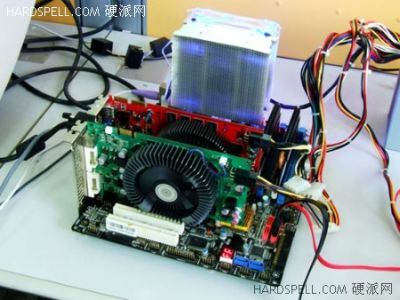 Hardspell used a Radeon HD 3850 along with a GeForce 9600 GT on the same system with the display connected to the Radeon, though no form of multi-GPU graphics connection existed, the GeForce card partnered the Radeon well in processing physics, while the Radeon did graphics. Results of the oZone 3D FluidMark, a benchmark that includes routines to evaluate the machine’s capability in processing physics, showed a greater than 350% increase in scores, showing that the GeForce accelerator is doing its job. [TEST] R257.15 Can Fix Everything: Radeon and GeForce Cards Can Now Work Again Together Side-by-Side for 3D and PhysX! wow thats crazy thats possible? i’m a noob in this but there is something that i need to confirm after seeing this article…. you have to have an sli motherboard for 2 nvidia cards of the same kind or a crossfire motherboard for 2 ati cards for it to work. Ok for you all asking how it was done: There is a nvidia driver hack that patches the nvidia driver allowing you to enable a Physx on an Nvidia GPU when you have an ATI card installed allready as your main rendering GPU. The Geforce card is going to be dedicated for Physx. The hack still work for latest Nvidia drivers. Cheers.